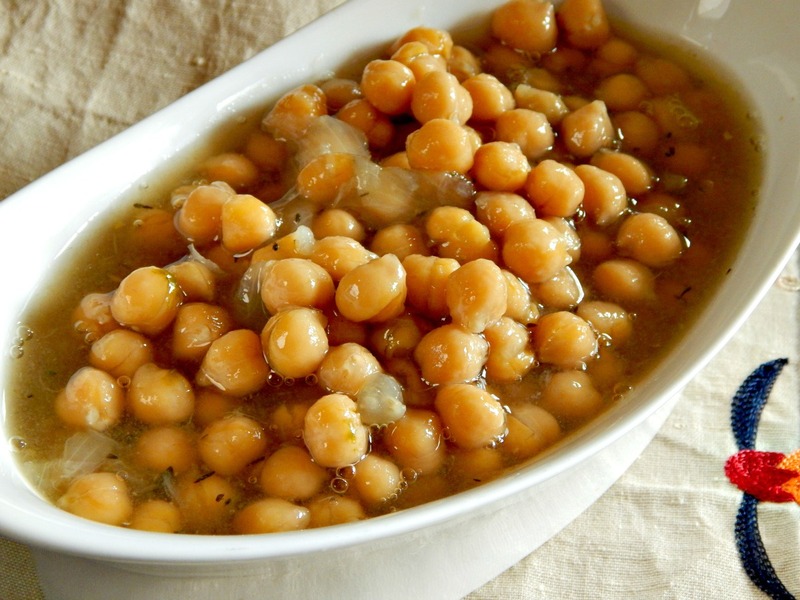 The chickpea, sometimes called the Garbanzo bean has been around since Man began cultivating and is a main staple of many diets, yet the lowly chickpea has often been relegated to not much more than a hummus ingredient here in the States. By the way, my Hummus is fantastic (if I do say so myself), as well as the wraps I make with them, and so are my Crunchy Oven Roasted Chickpeas) but chickpeas have so much more to offer! When dried chickpeas are treated lovingly from the start, simmered in herbs and aromatics, they’ll take on the most wonderful flavor – and the chickpeas will be tender, buttery and rich. They’ll also produce a lovely broth, something you’ll never get from the canned version (and they’re lower in sodium and less expensive than canned). One note: when I make this dish with dried herbs the chickpeas are very good, but if you have fresh herbs, they’re fantastic. I can hardly stop eating them. They are downright addictive. There’s really no reason to worry, though, about how many chickpeas you eat – according to the World’s Healthiest Food, the Garbanzo is full of protein and has a myriad of health benefits. Chickpeas help increase satiety (make you feel full faster), improve colon and cardiovascular health and a half cup of chickpeas a day will help lower and stabilize blood sugar. Plus, they’re dirt cheap! Look for dried chickpeas in the beans and rice sections of your store, and if you don’t see them there, don’t stop – check the aisles where Indian and Mexican foods are sold, generally on the bottom shelves. Markets and health food stores are great places to make sure you’re getting the freshest chickpeas – they’ll produce the tenderest chickpea. I thought I knew everything there was about the humble Chickpea until I picked up a Fine Cooking “Cook Fresh” magazine at the airport last winter on my trip to Georgia. If you read my blog, you know I’ll often take one long cooking ingredient and make extra to transform into other dishes – it’s seldom you’ll see a magazine do that, but Fine Cooking did. I’m going to be featuring a Roasted Cauliflower and Chickpea Salad made with this batch and perhaps a few more recipes are in store. I’m tossing in a few photos and links to my other Chickpea recipes, too, my Hummus and Wraps post, which contains a lot of information on comparative pricing, Oven Roasted Chickpeas, Falafel, and be sure to check out my Spinach Quinoa Salad for another great main dish salad. Use the freshest dried chickpeas you can find; shop at a place with high turn-over if possible. Soak overnight and don’t use the “quick-soak” method. If you’re worried about fermentation, soak them in the fridge. Simmer very slowly. Bring the pot up to a boil and immediately turn it down. Add a little salt, but wait until the beans are tender, about an hour, then continue to cook. Taste multiple beans when checking for doneness. If any are under cooked, continue simmering. Below is my adaptation of the Fine Cooking Recipe; I generally just drop in the herbs and onion and don’t worry about placing them in a cheesecloth bundle like Fine Cooking did. The few stems are easily picked out and the onion has fantastic flavor. Oven Roasted Chickpeas – these are flavored with Cajun Spice. Pick through chickpeas and discard any discolored ones or debris. Rinse well under running water. Place in cooking pot (six quart) and cover by a few inches and soak for six and up to twelve hours. Longer soaking may result in more split beans. Soak in refrigerator if worried about fermentation. Drain and rinse the chickpeas. Return to pot. Add onion and 10 cups of cold water and bring to a boil, skimming off any foam. Turn the heat down to maintain a very gently simmer (a few bubbles gently breaking the surface) and when the foam dissipates (a few minutes), add in the herb sprigs and bay leaves. Continue to simmer until chickpeas are just tender, about an hour. Add salt and gently stir, and cook until the chickpeas ae fully tender and creamy on the inside but still retain their shape, 15 to 30 minutes more. Test several to check for doneness. Drain and reserve liquid, discard herb stems and let chickpeas and broth cool to room temperature. Store in the refrigerator in separate airtight containers for up to five days. Note: these chickpeas can successfully be frozen for several months, in a Ziploc bag with some of the liquid. This entry was posted in Click here for Fabulous Food Posts and tagged Chickpeas, Dried Beans, Fine Cooking, Freezes Well. Bookmark the permalink. I’ve never cooked with chickpeas before and now I finally have a reason to! This looks so great! Thanks, Alli – I hope I inspired you then – I know, I know, chickpeas probably aren’t on the top of everyone’s bucket list of recipes, but you might be surprised! 🙂 Thanks for stopping by – I’m pretty excited by you and Quinn and Throwback Thursday and have only just started exploring your site! Love that Italian cake! Wow! Great post with really helpful tips – learnt that I am not soaking dried chickpeas for long enough! Really wonderful post, I love chickpeas, they are so versatile and delicious. I have been wanting to try to make chickpeas from the dry version for ages–I just never plan ahead well enough to soak them overnight, and end up using a can….but this post is inspiring me. It sounds like they taste so much better than the canned version! Brilliant – healthy – low-cost, heart and waistline healthy – the consummate health food! Well, they don’t compare to mousies (haha) but they’re pretty darned good! It’s no wonder they’ve been around forever!